A commonly recognized trait of the Hindu tradition is the notion of religious vegetarianism. A major reason that the study of Hindu vegetarianism is of particular interest is that the practice emerged some time prior to the Common Era (Bryant 194). The practice of vegetarianism is not universal among Hindus and the instance of practice varies amongst the various classes and the region of the country the sects originated. The exact percentage of vegetarians among Hindus could not be found but it should be noted that based on the 2004 census about a quarter of India’s population are vegetarians placing them as the minority. Early Hinduism was heavily involved in animal sacrifice, which still is common among some sects. In order to get a full understanding for the practice of vegetarianism, many aspects of the religion must be looked into. These include prescriptions in the religious texts such as the Vedas and the epics, as well as religious aspects such as Dharma and reincarnation, and religious guides such as the Laws of Manu. The reason to discuss the ritual of animal sacrifice in an article about vegetarianism is because it is important to see where the practice came from and how it came to be. Animal sacrifice has long been a ritual carried out in the Hindu tradition. The Vedas contain material specific to sacrifice, much of which are hymns used in the sacrificial ritual (Bryant 195). One of the most notable sacrifices is the as vamedha or the horse sacrifice. This ritual was undertaken by kings who wished to have a son. This is considered one of the most powerful sacrifices and required many animals to perish in the ritual’s enactment. This is considered a very powerful ritual and is also very expensive, but was done according to Vedic specifications to appease the gods in order to get what the king needed. The animals used in the sacrifice first had to be ritually slaughtered for use in that sacrifice and the meat was later consumed by those in the Brahmin class (Bryant 195). This is a stark contrast to the Brahmins of modern vegetarian sects, who are commonly the individuals who abstain from eating meat. This is not to say that the symbolism of sacrifice is not still important to Hindus. Offering the gods sacrifices to ensure that they are pleased by humans is still a big part of the religion. However according to the Laws of Manu that a sacrifice composed of butter and flour is sufficient to please the gods (Bryant 198). There are many aspects of the Hindu tradition that would lead to a vegetarian lifestyle. In the Hindu tradition every being on the earth, including animals and insects, contain an atman and also has the ability to be reborn in the next life as one of any number of entities (Bryant 194). If humans lead a life full of bad karma and an absence of dharma then they could be reborn into a lower class, e.g. as a sudra, or possibly even an animal. With the idea of an atman also came the notion of ahimsa which translates roughly as non-violence. Ahimsa in the Hindu tradition is extended to all beings with atman which is every animal. Since it is believed that all beings have an atman then killing and eating any of these beings would not be dharmic. The killing of animals for the purpose of a humans own enjoyment or for a human’s subsistence is believed to bring bad karma. For instance, scripture has stated that slaying a beast outside of the ritual context of a sacrifice to a god will cause the slayer to dwell in hell for as many days as there were hairs on the beast’s body (Bryant 197). It is also stated that those who avoid meat altogether obtain all their desires and fruits equivalent to those obtained with the as vamedha, they can even become a sage even in the stage of householder (Bryant 197). So, for an individual that lives the vegetarian life style, it is much easier and cheaper to obtain all the advantages of a high profile sacrifice (Bryant 197). In the Hindu tradition there is not a single god that is in the highest position, it depends on the worshipers and the god. The notion of vegetarianism thus extends even to the gods. Those only engaging in vegetarianism maintain a form of purity higher than those that are offered animal sacrifices. Those gods that are strictly vegetarian are considered superior “sanskritic” deities and are held above the meat eating deities. The sanskritic deities are also held to be of a purer nature and are more difficult to defile, and if they do become defiled they become pure more easily. For instance in one temple located in the south of India there are two gods worshipped, Aiyanar and Karuppan. Aiyanar is a vegetarian god and Karuppan is a meat eating god. This is an interesting case study because these two gods are housed in the same temple. When an animal sacrifice is made to Karuppan, a cloth is draped over Aiyanar so that he cannot see the slaughter (Fuller 90). “These two deities exemplify the two fundamental categories of deities, pure vegetarian versus impure meat-eater, as well as the relationship between them is homologous with that between high-ranking vegetarian castes and low ranking non-vegetarian castes”(Fuller 90). All deities are the objects of puja at which vegetarian offerings are made, but Karuppan is additionally offered animal sacrifice. In addition, no deities are ever offered only animal sacrifice because that would make them not a deity at all but a demonic spirit craving blood alone (Fuller 90). The epics, the Ramayana and the Mahabharata are ancient Sanskrit tales that depict ideal actions in different situations such as the actions of an ideal king. These epics also have lessons on killing animals and defiling deities. In the Ramayana there is a saying “whatever food a man eats the same is the food to be offered to his deity” (Fuller 103). This means that those worshipping a vegetarian god should be vegetarians in order to maintain that god’s purity. The Mahabharata contains some of the strongest statements against the harming or animals and the consumption of their flesh (Bryant 198). The Mahabharata in fact has three entire chapters dedicated to the evils of eating meat. In one story a sage was impaled on a pike by some thieves. When he asked the god Dharma why this had happened he was told that he had once pricked an insect with a blade of grass and he was now feeling the karmic consequences (Bryant 198). Several other stories found in the text depict great spiritual sages either being punished for harming animals or even causing themselves harm in order to save animals. Some of the most powerful words against the eating of flesh come from Bhisma, when he is talking to Yudhisthira, who in the epic is an extremely dharmic character. Bhisma tells him that humans who indulge in a diet of meat are of the vilest of human beings. He also tells him that the righteous in previous ages had gained entry into heaven by sacrificing their lives to protect the lives of other creatures (Bryant 198). The goal in Hinduism is to become liberated and to move beyond the cycle of reincarnation. Because of this it is easy to see why Hindus take on the practice of vegetarianism in order to avoid harming other creatures. These epics are deeply influential in the Hindu tradition and beings such as Bhisma and Yudhisthira are models to be followed examples. The Laws of Manu is a text that is influential for prescribing laws of action in the Hindu tradition. It is classified as a smirti (remembered texts), so it is not revealed by the gods. It does not state that animal sacrifice is wrong in fact he states that he subscribes to the customs of the Vedic forefathers. He also states that one who desires to increase his own flesh by the flesh of an animal is the greatest of sinners and that those who harm animals in order to please himself will never find happiness (Bryant 197). This goes back to the notion that all living beings are regarded as having an atman and to extinguish this for your own pleasure is unforgivable. “It is in Manu that we find the popular etymology of the term for meat: mam sah “me, he” (i.e., the animal whose flesh I eat in this life will devour me in the next world” (Bryant 197). Even though it is acceptable to eat the meat of a sacrifice, vegetarian Hindus avoid the meat altogether in order to ensure that no harm is ever caused to animals by them. The consequences of slaughtering an animal has implications on anyone who is involved in any step of the processing; this includes the butcher, the transporter, the merchant and finally the person consuming the meat. Whether a Hindu is a vegetarian or not, usually has to do with the caste that they belong to and where they are located. An example of this is in southern India where Brahmin culture tends to be strictly vegetarian. The practice is sometimes shared by high ranking non-Brahmin castes and these individuals tend to claim a higher status because they are following the Brahmin’s superior dietary code (Fuller 93). The Brahmins of the north are also usually vegetarians and it is held in high regard. Fish and meat are more widely eaten in the northern region and individual Brahmins tend to have more “lapses” in their strict vegetarian diets; so vegetarianism is less of an index to Brahminhood then it is in the south (Fuller 93). The warrior caste or Ksatriyas were traditionally a meat eating class. This is so because as the warriors and defenders of the other castes they needed to eat meat in order to increase their material strength. In fact meat eating by this class is held higher then vegetarianism even though it holds less prestige. The merchant class or Vaisyas follow in the footsteps of the Brahmins and are usually vegetarians, sometime even more strictly then the Brahmin caste. Bryant, Edwin (2006) Strategies of Vedic Subversion The Emergence of Vegetarianism in Post-Vedic India. Chichester, New York: Columbia University Press. Fuller, C.J. (1992) The Camphor Flame Popular Hinduism and Society in India. New Jersey: Princeton University Press. Article written by: Mike Stevenson (April 2010) who is solely responsible for its content. During many stages in a Hindu’s life, food plays a role. For example; in the Investiture with the Sacred Thread (Upanayana) ritual, the boy is “fed by [his mother] like a small child…this is expected to be the final time he will receive food into his mouth from her hands…The boy also begs for his first meal” (Rodrigues 79). Marriage, being one of the most important rites of passage, is celebrated with a huge feast. When the married couple has their first child, Brahmins are invited into the home and offered food in celebration. According to the Laws of Manu, Brahmins are quite restricted in who they can accept food from. Although there are many more restrictions, it is easy to see how eating food can be an ordinary, yet complex task when there are so many limitations to consider. If a Brahmin were to eat any foods treated in such a fashion as described above, that Brahmin would plummet into a high state of pollution. Non-Brahmin Hindus also take heed when eating and accepting food from others for the same reasons. It may seem that some of these dietary boundaries are purely common sense, such as not eating food that has hair or bugs in it. Other boundaries however, appear fairly extreme and would take a great effort to ensure these rules are followed if one wishes to remain pure. There are three categories of food that can cause anything from health and happiness to disease and sorrow. These categories; Sattvic, Rajasic and Tamasic are synonymous with the three Gunas (the primary qualities of nature). The Gunas are believed to exist in all human beings and are a part of Prakrti (that which keeps one from realizing absolute reality by binding one to material objects and emotions). The first and purist is Sattvic food. In this category food can be anything such as nuts, fruits, or vegetables. These foods increase one’s health, duration of life, strength, and happiness. It is believed that “when food is offered to one’s personal deity before eating, the deity would neutralize harmful energies contained in the food” (Jayaram a1). Thus the food becomes pure (Sattvic) and so does the eater of the food. The second is known as Rajasic (hot) food which can be bitter, salty, meat, garlic, onions or any hot, spicy foods (Saksena 1). It is said this food and/or Guna creates a person who is unhappy, sorrowful and diseased (Jayaram b1). The third and darkest or most intoxicating Guna is called Tamasic. Food under this category would be fermented, or considered untouchable. It would include such foods as meat, fish, poultry and eggs. Eating Tamasic food would make a person dull, sleepy or reckless (Jayaram b 1) Meat is especially important in the Hindu culture. Not for consumption but rather to avoid eating. Spiritual development is life’s purpose for most Hindus. The highest goal in life is to obtain Moksa, or freedom from worldly existence and Karma. Moksa is contrasted with Bhukti which is defined as the enjoyment of worldly pleasures (Rodrigues 52). Food is a worldly pleasure. Many people find satisfaction in food because of its taste, smell and its ability to eradicate the feeling of hunger. “With food, the [Hindu] regulates his mental states and aesthetic feelings and secures spiritual gains” (Ravindra 9). However, Hinduism offers another religious thought known as fasting. It is believed that fasting will bring you closer to Moksa. Fasting is going for long periods of time without food or with limited amounts of food. Depending on the type of fasting and for what occasion, the time period can vary from a few days to many years. The few Hindus who enter into the fourth life stage (Samnyasin) dedicate their time trying to achieve the goal of Moksa. There are variations of the ideal path, but fasting or restraining from any worldly pleasures is one way in which a Samnyasin attempts to reach the goal of Moksa. “Starvation [becomes] and [remains] a religious goal, even while eating extremely well [remains] a worldly goal” (Doniger 1). Food is most definitely a complex aspect of Hinduism. With all the different types of food that the world has to offer, Hindus are particular in choosing the food they eat and are also cautious about the source from which the food comes. Worship is taken to a higher level when food is involved. Hindus carry the belief that feeding the gods will keep the cycle of food distribution in motion. Through Sattvic, Rajasic and Tamasic food categories, Hindus are able to decipher which foods they shall eat in order to gain or avoid certain actions or emotions. In terms of actions, or Karma, Hindus are quite firm when it comes to avoiding the consumption of animals. “Do not kill an animal, for it might be your grandmother, or your grandchild, or you” (Doniger 1). Food is self evident, it is part of Brahman (Ravindra 5) Brahman is equated with Atman (true inner most self) and thus when you eat food, according to Hindus; you are eating yourself because food and you are one in the same. They are both part of Brahman which is the innermost essence of the created universe, the universe itself (Rodrigues 36). 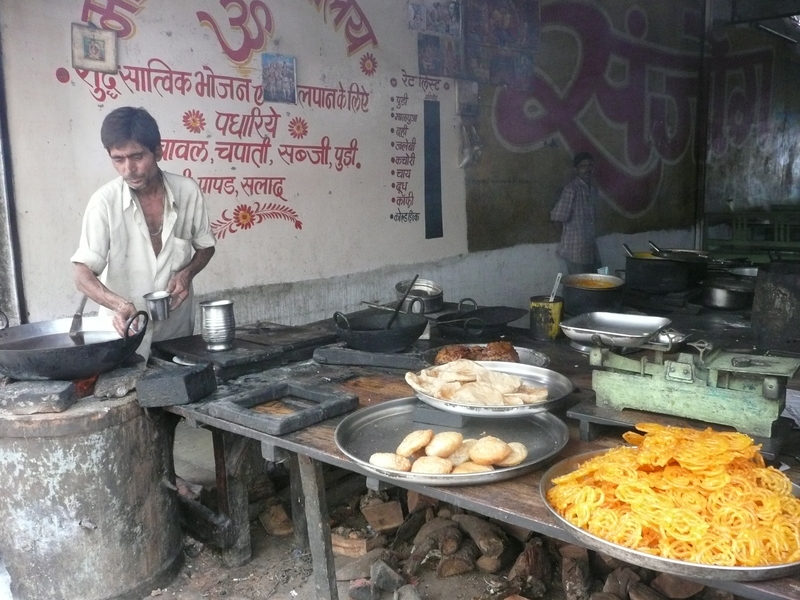 Hindu’s hold a deep knowledge and appreciation for food. “Food reflects survival on one hand and spiritual liberation in the other” (Ravindra 5). Ravindra S. Khare (1992) The Eternal Food: Gastronomic Ideas and Experiences of Hindus and Buddhists. Albany: State University of New York Press. Rodrigues P. Hillary (2006) Introducing Hinduism. New York and London: Routledge. Written by Tiana Mutter-Veitch (Spring 2008) who is solely responsible for its content.